It’s Fat Tuesday! Exciting, right? Not really. Because I’m not in New Orleans, and starting tomorrow I will be chocolate free for forty days. I thought about what I was going to give up for Lent this year for a long time. At first I considered going vegetarian, but considering red meat isn’t in my budget and I just admitted that I kind of hate chicken now, that didn’t seem like much of a sacrifice. Then I had a fleeting thought of giving up all sweets again like last year, but ultimately decided that wouldn’t be good for my mental health. Plus the blog would suffer. Best case scenario, I’ll be creative and come up with a bunch of delicious chocolate free desserts. Worst case, I’ll be going through a batch of oatmeal raisin cookies a week. So I decided on chocolate. It’s my ultimate vice, and my addiction is getting a little extreme. Last week I finished a one pound bag of pretzel M&Ms by myself in about 24 hours. I don’t like emoticons, but if they had one that conveyed shame, embarrassment, and self-disgust I would insert it here. This brings us to my last supper, of sorts. One last chocolate binge before I stop eating semisweet chips by the handful. 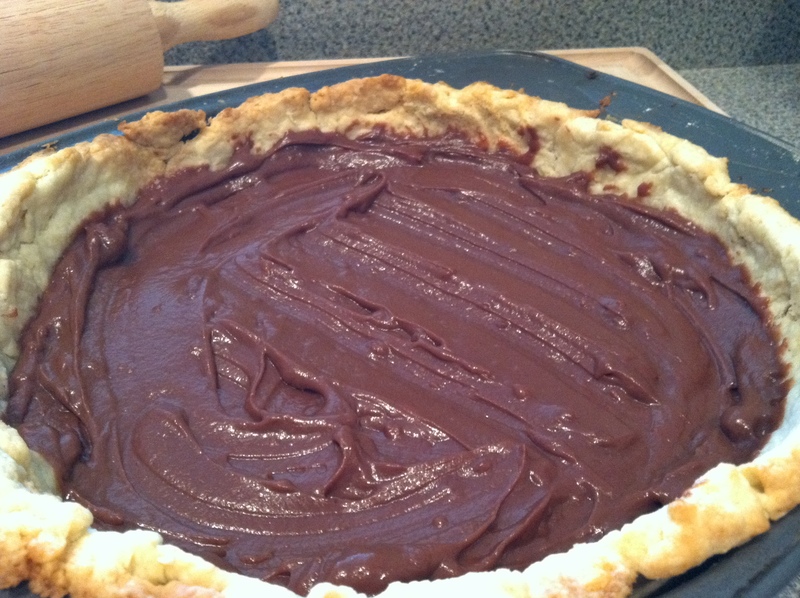 I’ve been wanting to make both pie and pudding for a while now, so this seemed like the perfect opportunity. 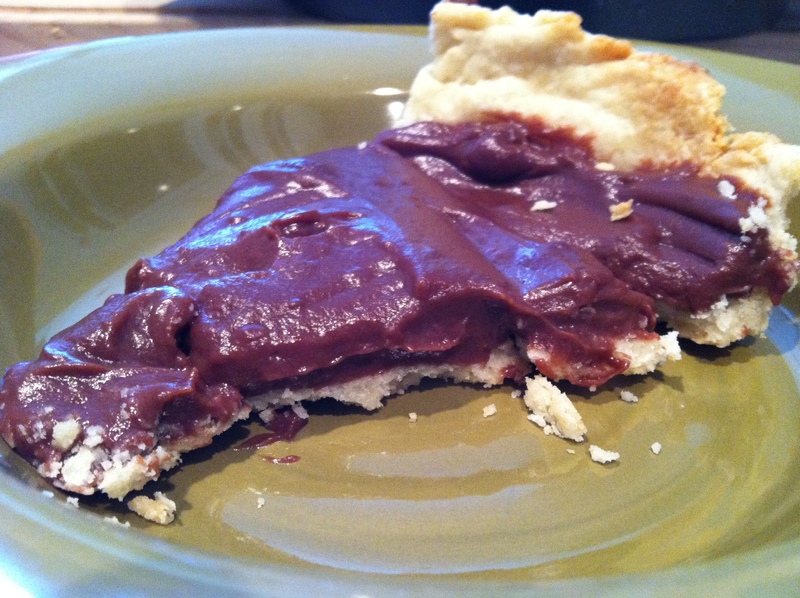 I looooove chocolate pie, and the only time I get it is on Thanksgiving when my Aunt Sue brings two of them and Chrissie and I split a whole one. 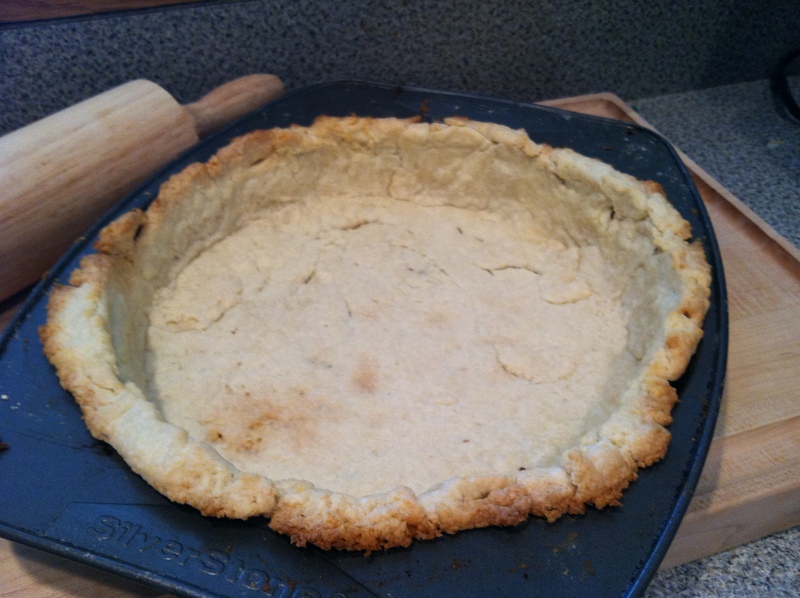 Mix the flour, sugar, and salt for the crust. 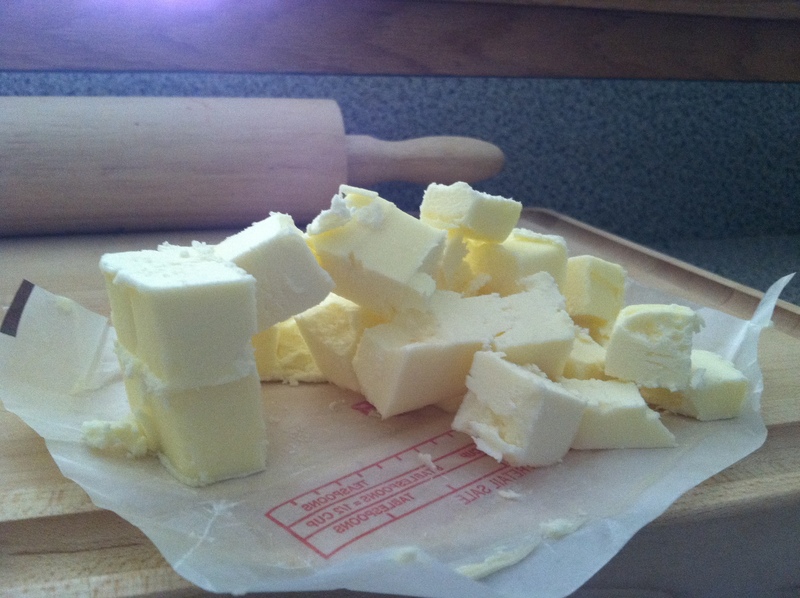 Add the butter and break up with your fingers until incorporated. Some will be flaky and some will be in little clumps. Add the ice water and vinegar and continue to incorporate until the dough barely holds together, without being sticky. Start with 2 tablespoons water and add it gradually until you get that texture. Form into a disc and wrap in plastic. Refrigerate for at least 1 hour. While the dough is chilling, start your pudding. 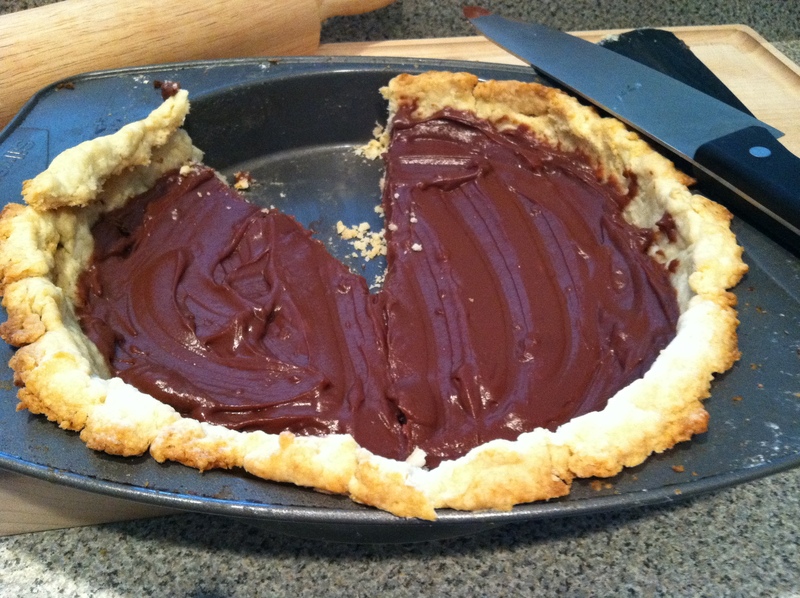 Put the sugar, cocoa powder, corn starch, salt, and chopped chocolate into a saucepan. I used half 72% chocolate and half semisweet chips. Mix the milk and egg yolk. Put the pan with your dry ingredients and chocolate over medium heat and stream in the milk mixture, stirring until everything is mixed and the chocolate is melted. Bring to a light boil and let it cook for another minute or until thick. It thickens fast! And it will look a little lumpy. Remove it from the heat and whisk in the butter and vanilla until smooth. 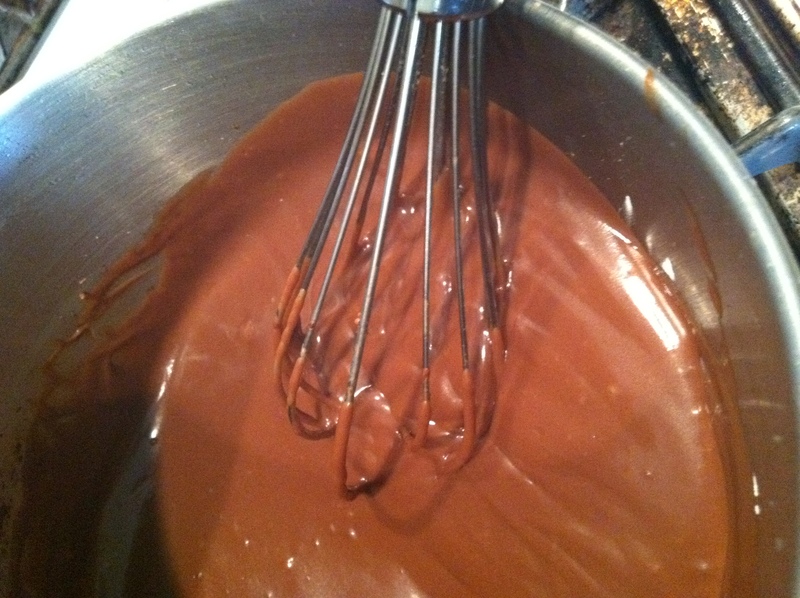 Pour into a bowl and cover, with the plastic directly on the surface of the pudding to prevent it from getting a skin. Refrigerate until cool. If I could have fit my face into the pot, I would have licked it clean. This pudding is rich and has strong chocolate flavor- you’d never know it’s made with skim milk. Preheat the oven to 400 degrees. Grease your pie pan with butter. 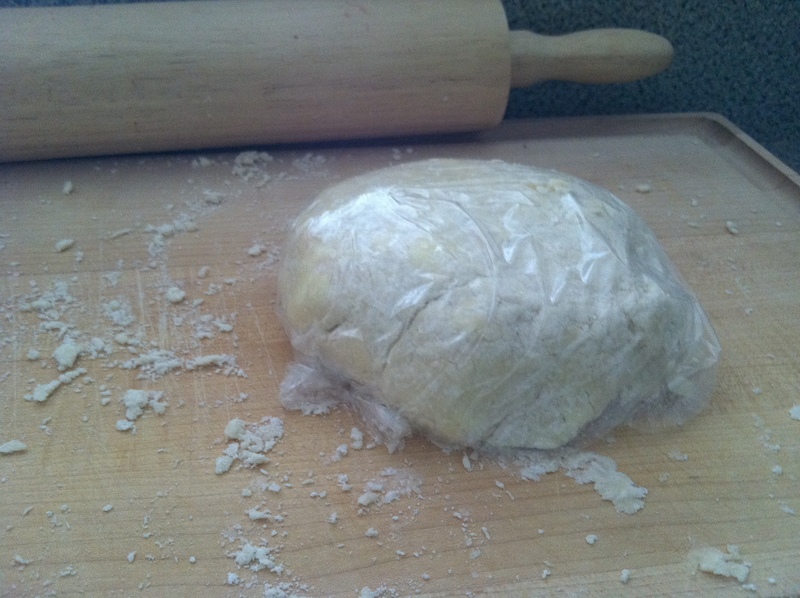 On a floured surface, roll out the dough into a circle. Clearly I learned my shapes in kindergarten. Press the dough into your pan. Mine broke a bunch of times, just patch it up with more dough. You’re going to cover it with chocolate-y goodness so it doesn’t matter what it looks like. Bake the crust for about 10 minutes at 400 degrees with pie weights. I covered my crust with tin foil and poured in some brown rice because I don’t have beans. Basically use whatever you have that is oven safe. Then I removed the foil and rice and baked the crust for another 10-12 minutes at 375 degrees. Making up techniques as I go along. I guess my patching skills need a little work. Once the crust cools to room temperature, pour the pudding in. Refrigerate until serving. Yummmmmmmmmm. If I eat the whole thing by myself tonight it doesn’t count. Send me tissues, the next forty days are going to be tough.